For guitarists, the technical learning curve for improvisation is fairly steep. For this reason, it is important to find multiple uses for the musical structures that you learn to execute. This approach decreases the learning curve considerably. It’s easy to learn and remember structures since they form recognizable “shapes” or patterns on the fingerboard, and playing parallel structures is something guitarists do naturally (a Minor 7 arpeggio moved up or down a fret is still fingered the same). Structural thinking provides a relatively easy way to generate more complex lines. It increases the number of ways to play over a given chord, and helps you find new paths through familiar chord progressions. It also helps you create interesting, unexpected movement from chord to chord. 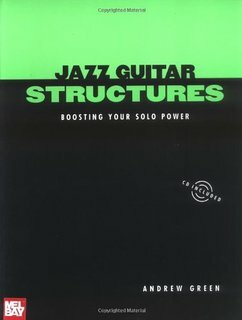 A structural approach makes it possible to see relationships between unrelated chords, a must for improvising on modern, non-functional harmonic progressions. Using similar structures also provides cohesiveness and makes it easier to play motivically. Since a book detailing the use of every structure would be unreasonably long, I present three structures in detail to provide some insight into this way of thinking. You will then have the ability to identify and use structures of your own. Learning to improvise can be a confusing experience. You are asked to deal with a large number of seemingly unrelated musical entities, then fashion them into coherent solos. On top of this, you hear the great players spin long, complex melodic lines that sound as if they were created from the 17th mode of the cryptophrygian harmonic major scale. They aren’t. These lines are actually made up of small, simple, easily identified structures these players have combined in interesting ways. This book will help you do the same.